In Summer Knight, Harry is dealing with the after effects of Susan leaving. He spends day and night trying to find a cure for her vampirism. To no avail. Anger and depression are the mainstays of his life now. He doesn’t eat. He doesn’t bathe. He doesn’t see any of his friends, whom are really worried for him. Harry has isolated himself in a manner that is hardly healthy. After meeting his friend Billy (and surviving both simultaneous attack from both a ghoul and a drive by shooting), Harry finds out that Billy has set up an appointment for him. Harry goes and meets the client, to find out that is is Mab, Queen of the Winter Court. She asks him to find out whom killed a man named Ronald Reuel. She also tells him that she now his purchased debt to Lenanasidhe, and she is willing to cancel the debt…after he does three favors for her. This is the first one and Harry really doesn’t have much of a choice. You do NOT say no, to the Queen of Air and Darkness, so therefore he is now the emissary for Winter. Again, I am trying not to spoil too much. But some things have to be said. Grave Peril starts with a new character. Michael Carpenter, Knight of the Cross. For some reason the ghosts of Chicago have been going crazy for the last few weeks, and Harry and Michael have been running all over the place trying stop them. Michael is a great addition to this serious, because he brings a character that faith driven. Oh, and he has the holy sword Amoracchius, which was created by one of the nails that was used to crucify Jesus. Awesome. Combined with plots dealing with Harry’s fairy godmother (Leanansidhe of the Winter Court of Fae), and ramifications of his actions in Storm Front with a Red Court Vampire named Bianca…this is the book that starts to move the serious toward being a great one. Harry and Murphy’s relationship was better after Fool Moon. Still not great, but better. Even to the point where with a few other CPD members, they took down a seriously twisted sorcerer named Leonid Kravos. So things are better. I am going to try to keep these as spoiler free as I can, but some things you just have to talk about. 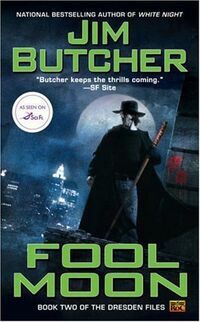 Fool Moon is the second installment of the Dresden Files. As much as I love this series as a whole, this is my least favorite book. That doesn’t mean I do not still like and enjoy it, but you have like something the least, right? two, Harry’s relationship with Karin Murphy. After Storm Front, you know they have a tenuous working relationship. As most people know, Ghost Story (Dresden Files, No. 13) is coming out this month, and I love these books so much that I always re-read them all before the next one comes out. I have read Storm Front probably about 8 times or so now, but I always get excited when I start them over. Of course I am a bit of a Dresden fanboy at this point. But to get to go back and see where Harry started (and for Jim Butcher as well) out is always fun for me. Harry is a Wizard. The only one listed in the Chicago phone book. This may seem like it would be difficult, because it is. Most people cannot take him seriously, since they do not believe in the supernatural. It goes with the territory and he takes that with a grain of salt…most of the time. The Dresden Files RPG (DFRPG) by Evil Hat Productions is their adaptation of the FATE 3.0 system to the world created by Jim Butcher in his novels. While not required reading to play the game, a brief overview of the novels will be helpful, as no such summary is included in the game, with that in mind, there are mild spoilers throughout. The novels are chiefly concerned with the cases taken by a private investigator who is also a wizard. He solves various crimes in the city of Chicago that have an occult connection. The writers of the RPG have done an excellent job of using an established intellectual property as a baseline setting and not allowing the characters from the novel to overwhelm the game, a situation that has hurt other settings in the past. The book itself is a large volume at just over 400 pages. The cover is a full wrap around image depicting Harry Dresden, Karrin Murphy and Michael Carpenter doing battle against a host of supernatural foes. The interior of the book consists of full color pages that are printed to appear as if a coil bound notebook. This appearance is due to the fact that the game is framed in such a way that it appears to be a manuscript of the game written by one of the characters from the series of novels. This stylistic choice is furthered by the inclusion of marginalia written by the “author,” a werewolf named Will, Harry Dresden and Bob, a spirit assistant to Dresden. Adapting a beloved book series into another format is brimming with challenges. What goes into your head is rarely what you see and/or hear in the adaptation. Even a movie winning the Oscar is decried by patrons of the source material. The Dresden Files is no different. In spite of the pitfalls, Jim Butcher has not shrunk from putting his work in as many different formats as possible. The Dresden Files received the TV treatment. This was met with condemnation from many fans, but I must admit that though I didn’t enjoy the show, it was what first made me notice Butcher’s work. 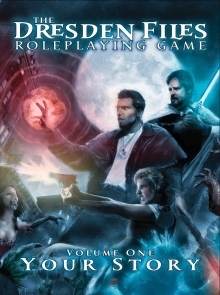 A new roleplaying game is out, something that fans of Jim Butcher know he would certainly have taken particular joy in seeing. And a limited series of comics entitled Welcome to the Jungle has been out and received positive reviews from this site and others. But Welcome was an original story. 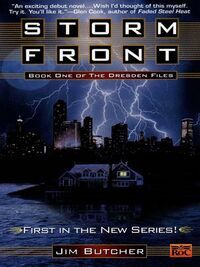 Storm Front is a true adaption of the first Dresden Files novel. 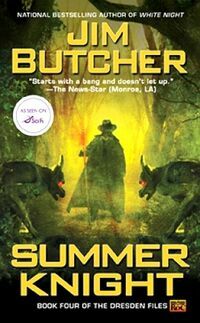 After I got done reading CHANGES by Jim Butcher, the twelfth novel in the Dresden Files series, the first words that popped into my head were, “Holy hell.” First? There is absolutely no way that I can review this book without spoiling something for someone, so consider this a warning – if you don’t want anything spoiled for you, then don’t read this review. Second? 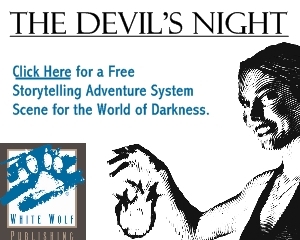 If you’re a fan of the Dresden Files, then this is “the” book for you. Turn Coat is the latest chapter in the ongoing adventures of Harry Dresden, Wizard for Hire. The book description above sets up some interesting possibilities and hints at some deeper character development (not to mention more exploration into the White Council). We do get some of those things in this book. For example, find out a lot more about Morgan’s past and the things that drive him to act the way he does regarding Dresden. Morgan has always been an interesting character for me. He is one of those guys you love to hate because of the way he treats our favorite wizard. There was always something about him that made me wonder just why he was so untrusting, so ready to kill in the name of the White Council. I never thought he was stupid or rash, the writing always hinted at a fierce loyalty and strong determination. Of course, for this series we readers are only getting Harry’s view on things and that rarely, if ever, painted Morgan in a favorable light (not that you could really blame Harry for that, I’d be less than charitable regarding a guy who wanted to behead me too). Dancing on the Head of a Pin is the second installment in Thomas E. Sniegoski’s compelling urban fantasy mystery series, which follows the adventures of Remy Chandler, once known as the Angel Remiel who chose to renounce heaven and live on earth. Dancing on the Head of a Pin picks up where A Kiss Before the Apocalypse left off. 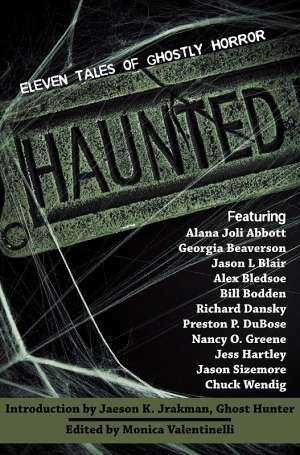 As Remy becomes drawn to cases with a dark supernatural bent he finds it difficult to distance himself from his past. When the theft of priceless ancient weaponry threatens all of humanity, Remy finds himself at odds with the Fallen Angels, who want to use the weapons to build their power, and the Nomads, who have far darker intentions. Will Remy’s search leave even an immortal such as he to the brink of death? Pre-Order Dancing on the Head of a Pin at Amazon.com. We have a special deal for our readers today! Buzzy Multimedia is offering 10% off any purchase to Flames Rising fans for a limited time. Drop by the Buzzy website to check out some very cool deals on Dresden Files audio books read by James Marsters (Spike from Buffy: the Vampire Slayer). Get 10% off any purchase at the Buzzy Multimedia Store until February 28th. Simply type “FR10” in the coupon code section during your checkout to get the deal. One of the great elements of Jim Butcher’s Dresden Files series is the large cast of interesting characters that Harry Dresden encounters throughout his adventures. Friends, foes and fellow wizards make up a variety of supernatural (and a few “normal”) beings in the Dresden-verse. One of the most interesting characters is Harry’s half-brother Thomas Raith, who also happens to be a vampire. Although the marketing for this tale makes claims of it being a novella, I’d have to say it is more of a short story with great art. Without the fancy hardcover or the illustrations by Mignolla this would fit just fine in one of the urban fantasy anthologies we’ve seen other Dresden Files tales in (My Big Fat Supernatural Wedding for example). Princeps Fury is the latest novel in a series dubbed “Codex Alera” by Jim Butcher. The fifth book in the series, its plot centers around a promise made in the previous book and the deadly war between the Vord and well, everyone else. Alera, the Kingdom run by the First Lord who isn’t well liked for many, intricate reasons, is under attack while Tavi escorts the Canim back to their homeland over a turbulent sea. Book three of this series has Tavi being sent out of the way (both because of who he is, and to get training) to infiltrate a new legion being created. Since most lord’s have their own legion, a new one was being created to try to serve no political uses. But Tavi is supposed to see if anyone in the legion is in fact a spy. That is what he does since he is a Cursor (also a spy) for the First Lord. Quickly, things escalate. Lord Kalare, whom has eyes on the First Lord’s throne, launches an attack and starts civil war in the realm. He also kidnaps other high ranking nobles, and holds them prisoner at his fortress. When reviewing this graphic novel, I have tried to be as impartial as I can be. But the problem is that I am just a Jim Butcher fan that it is very hard. I have read all of the books, I am play testing the RPG based on it. Yeah, I am a fan. But I did at least attempt to be as partial as I could. It probably was not very successful. Welcome to the Jungle was a 4 issue comic release revolving around Jim Butcher’s creation, Harry Dresden. For those of you familiar with the story, it takes place shortly after his first novel, Storm Front.